Guwahati: A speeding inter-city train going to Tinsukia killed a 7year-old elephant at Kurkuria under Sonapur range in Kamrup district on Wednesday night. The female elephant, which was separated from its herd, after being hit was dragged along the track for quite a distance. Forest officials said that the post-mortem of the elephant was conducted on Thursday. Elephant accidents like this have of late become a regular affair in the state. Trains account for 37 per cent of elephant deaths in the country. With this killing, the total death toll of elephants due to collision with speeding train has increased to four s o far this year. Last month, an elephant was killed by a speeding train at Gibbon Wildlife Sanctuary in Jorhat district. Two more elephants were knocked down to death in Karbi Anglong area in February and June respectively. 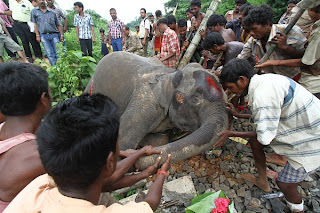 Another elephant was injured by a moving train at Deepor Beel area in May this year. Elephants continue to come under the trains at various locations in spite of marking the areas as danger zones. The three major danger zones are Deepor Beel, Daldali Reserve Area of Karbi Anglong and Hoollongapar Gibbon Sanctuary. Wildlife activists allege that due to lack of cooperation from the railway department such accidents take place. “On an average, 8 to 10 elephants die each year in train accidents. And the same number of elephants die when poachers of people hunt or poison them,” said MK Gogoi, the founder director of Friends of Nature, an NGO. He also said that on several occasions the incidents go unrecorded as the injured elephants simply vanish into the jungle after being hit by a train. “They later die and thus it is recorded as natural death,” he added. In most of the cases, it is the female and calves who become the victims. According to rule, a train has to lower its speed to 30 kilometre or lesser in the elephant corridors. “The railway rule book says that a train can be stopped even at the speed of 45 kilometre per hour on certain conditions. But train drivers never obey such rules and regulations and continue hitting the elephants,” he said. The elephants follow the same route according to their behaviour and if they are barred or if they find resistance they tend to go wayward and disturb the neighbouring areas. In Hoollongapar Gibbon Sanctuary, three elephants have lost their lives in the past nine months. Seven elephants were killed by a speeding train in a single accident in Bogapani area in 2007. In Dibru-Saikhowa at least five elephants were killed in the past five years. “In the past five years, more than 35 elephants have been killed by the poachers or villagers. Villagers often poison them to get rid of their menace,” he added.